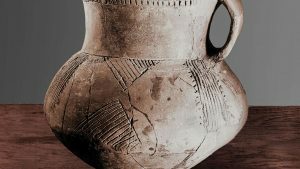 The creators of the Corded Ware culture, named after this intricate pottery, may have spoken an Indo-European language derived from one spoken by herders from the East. 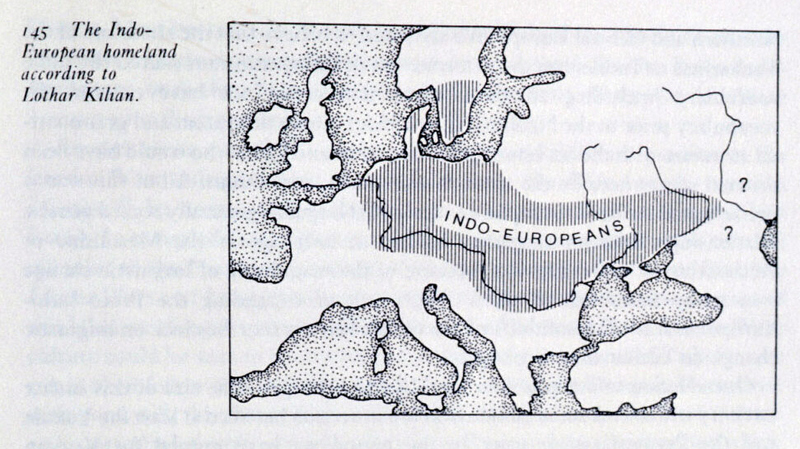 The discovery of the Indo-Europeans is one of the most fascinating stories in modern scholarship. The tale begins with linguists in the late 1700’s, in particular, William Jones, a British judge who lived in India and in 1786 was the first person to suggest the possibility of Indo-European civilization. Jones’ hypothesis opened a new door to the past and sparked the modern science of historical linguistics. 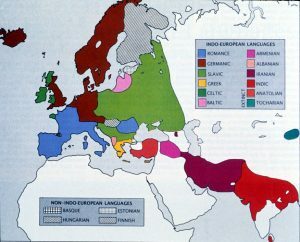 Indo-European theory rests on the fact that various languages from all across Eurasia, in lands as far apart as India and Iceland, show many essential similarities, enough that they must have originated as a single tongue at some point long ago. Once Jones’ successors began exploring the full linguistic record from this perspective, corroborating evidence started pouring in from all quarters. Parallels in vocabulary and grammar quickly emerged among foreign languages, particularly in what were then the oldest preserved tongues: Latin, Greek and Sanskrit. The last is the language of The Vedas, an ancient body of writings from India, and close analysis of its text showed that Sanskrit has a strong affinity with Latin and Greek. For instance, the Sanskrit word for “three” is trayas, clearly cognate with (i.e. from the same linguistic origin as) Latin tres and Greek treis, also words for “three.” Likewise, the Sanskrit sarpa, “snake,” obviously shares a common ancestor with the Latin serpens, the forebear of the English word serpent.
. . . no philologer could examine all three languages [Sanskrit, Latin and Greek] without believing them to have sprung from some common source which, perhaps, no longer exists. “Which perhaps no longer exists,” this priceless piece of understatement was the overture to many important, indeed revolutionary insights into the history of Western Civilization. First and foremost was that there must once have been a “mother” tongue which, as the peoples who spoke it spread across the globe, evolved into a family of “daughter” languages all of which, though they look different on the surface, are fundamentally related. Since these languages can be found all over Europe and Asia, scholars ultimately settled on the term Indo-European for this culture, and Proto-Indo-European as the designation for the mother tongue itself. While it would be better to call the language by the name its original speakers gave it, that isn’t possible since no one has as yet been able to figure out what that name was, or for that matter what the Indo-Europeans as a people called themselves. Despite that, however, scholars were able to deduce much else about them. For instance, as the study of linguistics advanced, it quickly became clear that quite a few languages belonged to the Indo-European family. “Threes,” again, demonstrate the point well. 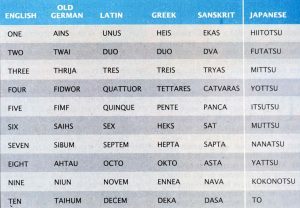 Besides Latin (tres), Greek (treis) and Sanskrit (trayas), there are Spanish (tres), Danish, Italian and Swedish (tre), French (trois), German (drei), Dutch (drie), Russian (tri), English (three) and several other permutations all based on Indo-European *trejes. That these words are cognate is self-evident, especially when they’re compared to “three” in non-Indo-European languages, such as Turkish (uc), Hebrew (shelosh), Malay (tiga) and Chinese (san). And adding in other basic Indo-European words like mother/moeder/mater and father/pater/patir makes the case overwhelming. All these languages which exhibit so many cognates must once have had a common source. The ramifications of Indo-European theory were explosive, especially to Europeans in the nineteenth century. The presence of a long-lost common language presupposes, by definition, the historical existence of a common culture—anthropologists have shown that unity of culture nearly always accompanies unity of language—and, as the Indo-Europeans spread both widely and successfully across the globe, that culture must have traveled with them. 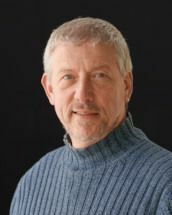 Given that, scholars began looking at the fundamental similarities in native Indo-European civilizations and found remarkable parallels, the implication being that, for all their seeming differences in religion, government and family structure, peoples of Indo-European heritage share a cultural framework consistent with a shared origin. That is, the fundamental similarities in their cultures overshadow their superficial differences. It was a notion that was not well-received in all circles, especially the Eurocentric, white-supremacist factions which dominated the West in the nineteenth century. Finally, linguistic research showed how extraordinarily successful these Indo-Europeans were in their near-global usurpation of the planet. To list ancient Indo-European civilizations is virtually to catalogue conquerors across Europe and western Asia: Indo-Aryans, Persians, Hittites, Greeks, Romans, Celts, Vikings, Medes and Philistines, to name just a few. And their modern counterparts are no less numerous, among them, Spanish conquistadors, Christian crusaders and all the major European colonial powers. Though there are also many ancient peoples who are not Indo-European—Sumerians, Egyptians, Elamites, Hurrians, Hebrews, Pelasgians, Etruscans, Assyrians, and Minoans—their Indo-European counterparts ultimately came to dominate Europe and, henceforth, much of world culture. Indeed, the triumphs of the ancient Indo-Europeans have carried over into the modern age, in which now more than half the people of the world speaks a language descended from Proto-Indo-European. To understand how Indo-European culture rose to such prominence, one must look far back in time. In late prehistory, waves of Indo-Europeans began migrating in several directions across the Eurasian continent, displacing natives and even other Indo-European settlers who had entered an area earlier. Scholars debate when exactly these massive migrations began—some say as early as 8000-5000 BCE, while others put it fairly late, after 3000 BCE—but it’s clear that by the third millennium (3000-2000 BCE) the Indo-Europeans were on the move. As they settled different areas of the world, they uprooted and overwhelmed indigenous peoples, which spelled in more than one instance the extermination of entire cultures. Indo-European groups moved into India, for instance, where they conquered the local population and established the caste system, with themselves at the top, of course. Likewise, a different Indo-European group invaded Italy and settled there as the Romans. Others became the Slavs in central Europe and the Philistines in the Near East. In every case, they caused upheaval and violent social change. The Greeks provide a good example of the behavior typical of these conquerors. No fewer than three major waves of Indo-Europeans swept over Greece in the second millennium BCE, the last of which was the ferocious Dorian invasion that pushed aside at least two previous groups of Indo-European invaders and precipitated so much chaos that a centuries-long dark age ensued (1100-800 BCE). It’s little wonder, then, that the native Pelasgians, an indigenous people in Greece, are now a historical mystery. When brutal invaders set about obliterating each other, native cultures have virtually no chance of survival, either in their own age or the historical record. One of the major regions the Indo-Europeans settled was northern Europe, where there evolved an offshoot of the Proto-Indo-European language, a linguistic variant now called Common Germanic. Once established there, the speakers of this tongue drifted apart into various groups, as they continued to expand their domain, and this separation underlies the divisions still visible in the political and cultural landscape of northern Europe and in the different languages spoken there: the Celtic group including Welsh, Scots Gaelic, etc. ; the Germanic group including German, English, Dutch, Yiddish, etc. ; and the various Scandinavian tongues (Swedish, Danish, Norwegian, etc.). Each of these derives from a distinct sub-population of Germanic speakers. With the data presently available, it’s not possible to be precise about when these languages started separating, but it seems safe to say that by the first century BCE (i.e. after 100 BCE), there’s good evidence Common Germanic had begun to break up. The natural topography of the area clearly contributed to these linguistic divisions. The Scandinavian languages evolved north of the Baltic Sea and in Denmark. West German arose west of the Oder River. On the other side of this river in modern Poland, East German developed. The last (East German) is extinct now, because all of its “daughter languages” were wiped out of existence by the subsequent oppression of its peoples. Polish, the primary language of modern Poland, is instead an offshoot of Old Slavic, a different branch of Indo-European. In politics and military affairs, speakers of West German were in general more successful than their Eastern counterparts, and the languages which arose out of West German culture (English, German, Dutch, etc.) all share an interesting feature. To grasp it, however, it is first necessary to understand some fundamental aspects of language, in particular, how sounds are produced in the mouth. In doing so, we gain insight into an important chapter in the history of the West German people, and an even more fascinating transition in the linguistic history of Europe. After William Jones suggested that Latin, Greek and Sanskrit shared a common origin, the pace of linguistic study began to accelerate rapidly in the West. In part, this was due to the appearance of eager young scholars who were interested in exploring the world around them and making a name for themselves in academia. The most famous of these was Jacob Grimm (1785-1863), one of the famous Brothers Grimm. As a student of language, Jacob Grimm studied early German literature, seeking rare words unchanged over time, archaic vocabulary which might elucidate the history of the German language. What he ended up with, however, was a fascinating body of folklore which he and his brother Wilhelm published as Grimms’ Fairy Tales. The often macabre and sinister nature of these tales involving enslavement, poverty, starvation, abduction and even cannibalism reflects the dark view of those living where there’s little protection from the vagaries of man and nature. It’s one of the few glimpses history affords of non-urban life in Western Civilization, and it’s not a pretty picture. Grimm also got what he wanted word-wise. After some study he noticed a pattern in the evolution of Common Germanic as it was developing out of Proto-Indo-European, a change that he deduced had to have taken place long ago. This change came to be called the Great Consonant Shift. Grimm demonstrated that, even if a Germanic word and one from a different branch of Indo-European didn’t look alike on the surface, in many cases they could be shown to be cognate with each other if one assumed that certain consonants had followed a predictable course of change. This linguistic rule was later dubbed Grimm’s Law. Here’s what happened. At some point in the evolution of West German, some of its consonants began to shift dramatically. To understand how and why this shift occurred, one must look at the nature of consonants themselves, which are formed by briefly stopping the flow of air through the mouth (p, t, k, b, d, g) or by restricting it somehow (f, v, th, ch, j). The Great Consonant Shift in Germanic languages appears to have begun when a certain type of consonant called unvoiced (p, t, k) transformed into its aspirate equivalents (ph, th, kh). Once that change took place, it put pressure on the original aspirates to sound different from the new ones in order to maintain enough distinction among words that sense wasn’t lost. That is, if your tongs suddenly are thongs and your pans become fans, there’s considerable fothential for conpusion. Consequently, what had originally been aspirates in Common Germanic (ph, th, kh) moved to their voiced equivalents (b, d, g). And soon thereafter, the original voiced consonants (b, d, g) did likewise and changed into their unvoiced counterparts (p, t, k), thus taking Common Germanic consonants in a full circle: from unvoiced to aspirate to voiced. Bearing in mind that vowels are fluid and change unpredictably and that liquids (l, r) and nasals (m, n) are not as a rule affected by processes like those underlying Grimm’s Law, we can deduce the Germanic—in this case, English—word which is cognate with its Indo-European form before it underwent the Great Consonant Shift. 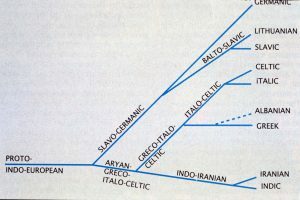 Since Latin and Greek are Indo-European tongues which stand outside Germanic and therefore were not influenced by Grimm’s Law, words from these languages show the Indo-European root which Germanic inherited and changed. And because English contains many derivatives from Latin and Greek, we find within our own language words which do not look much alike but have similar meanings and are, in fact, cognate. For instance, the Indo-European root *pater which gives us words like paternal and paternity changed into father in English because the inherited p became f and t became th. The same thing happened to the th in mother which comes from an Indo-European base *mater, but the m was not changed because nasal consonants like m were not affected by Grimm’s Law. 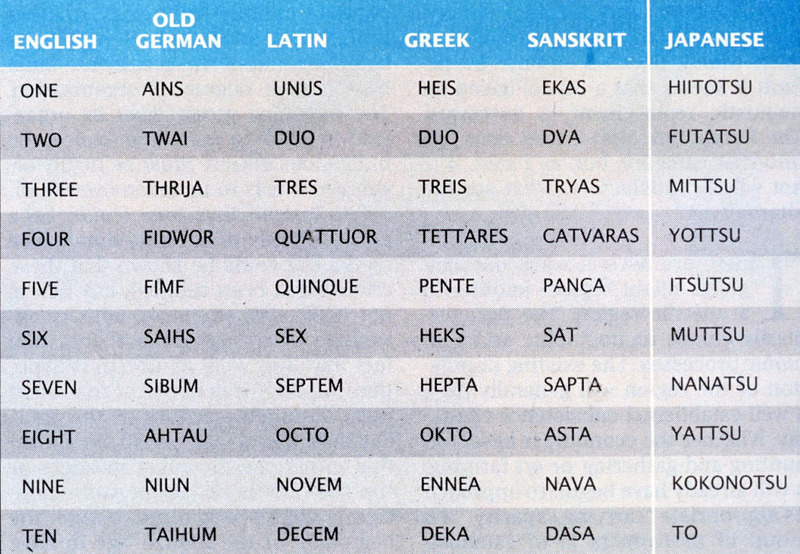 In the table below, use the Latin and Greek words and their English derivatives (in the left and center columns) to determine the changes which took place in Germanic words as outlined in the table of Grimm’s Law cited above. By doing this, you should be able to decipher an English word which has the same basic meaning and Indo-European root but looks different because the Indo-European root word has undergone the Great Consonant Shift. In order to figure out the Germanic cognates, you may have to change, move or omit some of the letters in the Latin or Greek words—especially vowels and liquids (l/r) . But language is not all there was to the Indo-Europeans. Anthropologists have long pointed out, as noted above, that language and culture go hand in hand. So, while shedding new and important light on the evolution of language, historical linguists have also discovered much about the Indo-Europeans’ lives and livelihoods. Nevertheless, much remains uncertain, even such a basic question as where the Indo-Europeans lived before they embarked on their world-wide journeys and conquest. Let’s begin by looking as what is today unknown about the Indo-Europeans. Simply put, there is still no unequivocal evidence from either historical or archaeological sources for exactly where, when or how the original speakers of Proto-Indo-European lived. No site, no technology, no extant historical text, no particular past event has as yet been definitively associated with the people whose descendants would later spread Indo-European culture and language across the entire globe. The Indo-Europeans are at present in strictest terms a linguistic phenomenon, which is not to say their culture never existed—there is overwhelming evidence it must have at some point in history and, without doubt, somewhere in Eurasia—but that’s not very precise. Indeed, we cannot speak about Indo-European history and geography with certainty, which has not stopped scholars, however, from trying various means to determine the time and location of the original Indo-Europeans. For instance, based on calculations of the general rate at which languages change, attempts have been made to reason out how long ago Proto-Indo-European began to break apart. That is, by looking at how different its daughter languages are from one another, it may be possible to get a sense of the extent of time it took to create that number of variations in grammar and vocabulary evidenced in Indo-European languages. This is called glossochronology and, though some linguists endorse this method of measuring language change, it has not found widespread favor among scholars. In actuality, the rate of language change can vary widely according to circumstances—languages sometimes evolve quickly and other times slowly—and none of it is predictable. All in all, the original Indo-European culture almost certainly existed at some time between 5000-2000 BCE, but such a wide range is not very helpful to those trying to assess the Indo-Europeans’ role in history or tie them to particular developments in a certain age. Where they lived is no less difficult to assess. Called the homeland problem and a matter of great debate among scholars, this question may ultimately also be unanswerable, inasmuch as the Indo-Europeans were in all likelihood a nomadic people and, while they may have had a home range, it’s possible they had no specific homeland as such. And because nomads leave behind few traces archaeologically, at least compared to settled folk, historians are left grasping at straws in the wind here. Tantalizing hints, however, emerge from the data, too. 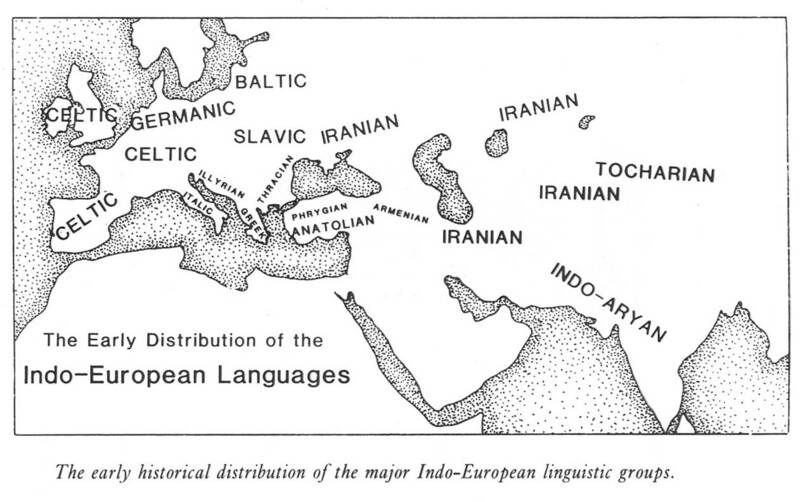 For example, the patterns of dispersion among Indo-European languages should after all furnish some sort of indication as to the migrational paths followed by the Indo-Europeans. Tracing those backwards ought, then, to provide at least a general indication of their place of origin. Moreover, similarities and differences in the daughter languages should also help point to how this dispersion proceeded, or at least where groups were at different times. But unfortunately, just as with glossochronology, there are too many variables at work, and no consensus has emerged among scholars about anything but the most basic solutions to the homeland problem. In sum, it seems safe to say only that the Indo-Europeans probably lived in or around the steppes of southern Russia at some point, simply because that area is central in the vast territory their descendants would later come to occupy. Little more can be said with certainty. In spite of not being able to answer some of the most basic questions about the Indo-Europeans, the body of data about them that we do have is very great, too. Of the original Indo-European civilization, many features can be reconstructed by comparing similar elements found widely among its daughter civilizations. For example, the Indo-Europeans must have been polytheistic, since all Indo-European cultures are—or at least were originally—that way. Their chief god was probably an entity whom they called “Sky-Father,” because a name of this sort is seen in quite a few daughter cultures, for instance, the Romans whose principal deity was known as Ju-piter (“Day-father”) and the Greeks whose god Zeus (“Day”) headed up their pantheon. The Indo-Europeans must also have favored tripartition (“division into threes”) the tendency to envision and express the world in groups of three, which was a familiar habit of ancient Indo-European culture. For example, it’s likely Indo-European society was separated into three basic strata: priests, warrior-rulers, and farmer-workers. 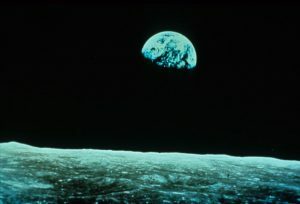 Similarly, three fundamental elements constituted their universe: sky, sea, and earth. Indeed, our fondness for threes today surely derives from the Indo-Europeans’ love of tripartition, such that many today envision God as a trinity of Father, Son, and Holy Ghost, and a good argument as having a beginning, middle, and end. We also start a race by saying, “Ready, Set, Go!”—why isn’t it just “Ready? Go!”—our nursery rhymes feature “Winken, Blinken and Nod,” we love waltzes set in three-quarters time and, as most lawyers will confirm, three examples are usually enough to make a convincing case. There is strong evidence from a wide range of data that these characteristics of life in the West today have their origin in Indo-European culture.
. . . many family words (such as ‘mother’, ‘husband’, ‘brother’) can be reconstructed for Proto-Indo-European. These include several words for ‘in-laws’, which seem to have been used solely with reference to the bride. Evidence of this kind suggests that it was the wife who was given a position within the husband’s family, rather than the other way round, and that the society must therefore have been patriarchal in character. That is, in Proto-Indo-European society there were special words for the bride’s parents because the “family” was presumed to mean the groom’s family, the core social unit as it often is in patriarchal societies. 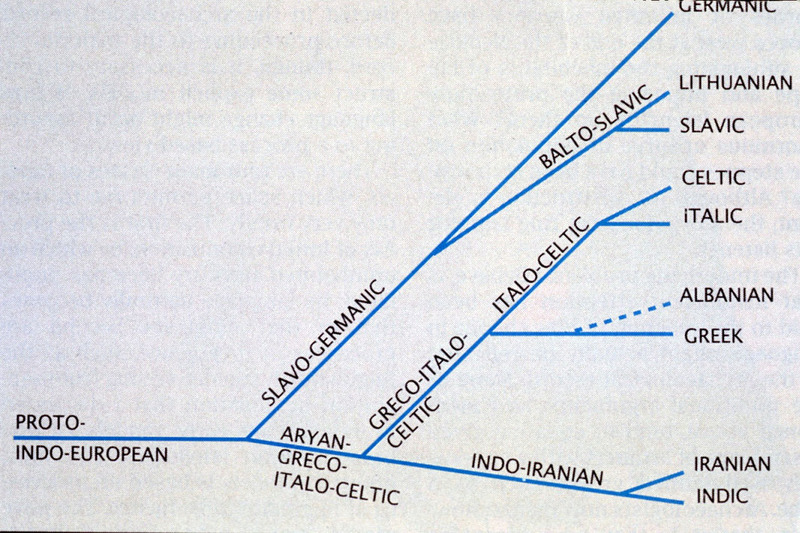 Furthermore, that some Indo-European languages share a base that means “king” (*reg-, literally “straightener”; cf. English regal) suggests the Indo-Europeans had or knew about “kings” of some sort. They probably also had cows (*gwous), as well as sheep, pigs, and dogs. They lived in villages (*weik-, cf. English vicinity), knew about silver and copper, had ships (*nau-, cf. nautical) as well as bows and arrows and rode horses (*ekwo-, from which we get equestrian). There are no anciently common Indo-European words for elephant, rhinoceros, camel, lion, tiger, monkey, crocodile, parrot, rice, banyan, bamboo, palm, but there are common words, more or less widely spread over Indo-European territory, for snow and freezing cold, for oak, beech, pine, birch, willow, bear, wolf, otter, beaver, polecat, marten, weasel, deer, rabbit, mouse, horse, ox, sheep, goat, pig, dog, eagle, hawk, owl, jay, wild goose, wild duck, partridge or pheasant, snake, tortoise, crab, ant, bee, etc. With no common word for “ocean,” it seem unlikely the Indo-Europeans were originally a coastal people. No shared word for “vine” makes a Mediterranean origin improbable, too. But even with such compelling and specific linguistic data, scholars still cannot agree as to the exact whereabouts of the aboriginal Indo-Europeans. Thus, the homeland problem remains just that, a problem. Conclusion: Who Were the Indo-Europeans? In conclusion, who were the Indo-Europeans? The truth is, we do not know who they were, but we do know who they are: virtually everyone of us, at least in some way. Seen genetically, Indo-European heritage encompasses all peoples of Germanic or Scandinavian or southern Mediterranean or Persian or Russian or northern Indian descent, any of a wide range of national groups stemming from India to Iceland. Viewed culturally—that is, as part of a common civilization—everyone who speaks an Indo-European language, or has an innate cultural predilection for threes, is the heir of Indo-European might and main. From that perspective, it’s hard not to see Indo-Europeans everywhere! And thanks to these ancestors’ invasion of every continent on earth and usurpation of much of its natural wealth, the descendants of the Indo-Europeans represent one of the most populous and pervasive cultural forces on the planet. But the price of that success has been quite steep, in almost all cases, the extinction of native cultures. Seen this way, the colonization of the Americas is just one more Indo-European invasion in which the modern descendants of these most efficient conquerors overran and imposed their way of life on yet two more continents of natives, just another set of hapless victims. It should come as no surprise either, then, that the first men to walk on the moon were of immaculate Indo-European pedigree. “One small step for a man” are all Indo-European words. 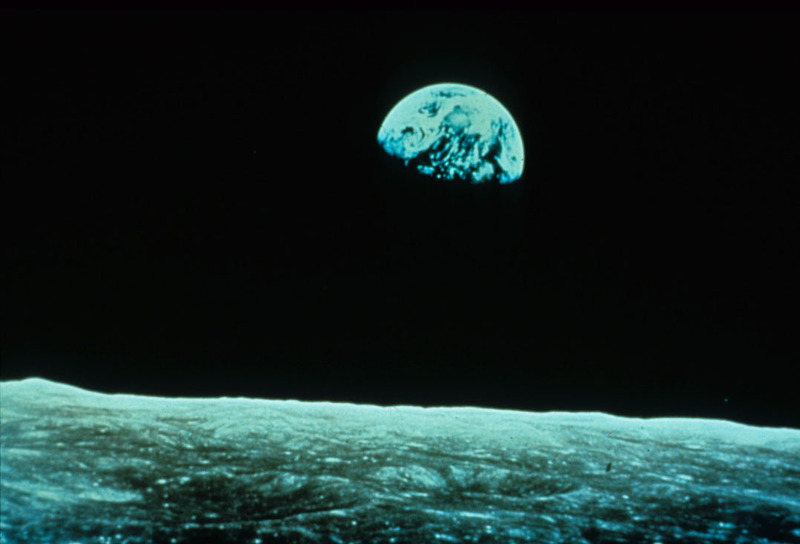 And the Indo-European nature of our adventures in space may explain another feature of these explorations: the reason we show so little eagerness to return there. Perhaps that’s because we’ve found no lunar natives to displace as yet. This entry was posted in History, Linguistics. Bookmark the permalink.